Purpose and scope The aim of this Position Statement is to provide recommendations for Canadian medical geneticists, clinical laboratory geneticists, genetic counsellors and other physicians regarding the use of genome-wide sequencing of germline DNA in the context of clinical genetic diagnosis. This statement has been developed to facilitate the clinical translation and development of best practices for clinical genome-wide sequencing for genetic diagnosis of monogenic diseases in Canada; it does not address the clinical application of this technology in other fields such as molecular investigation of cancer or for population screening of healthy individuals. Methods of statement development Two multidisciplinary groups consisting of medical geneticists, clinical laboratory geneticists, genetic counsellors, ethicists, lawyers and genetic researchers were assembled to review existing literature and guidelines on genome-wide sequencing for clinical genetic diagnosis in the context of monogenic diseases, and to make recommendations relevant to the Canadian context. The statement was circulated for comment to the Canadian College of Medical Geneticists (CCMG) membership-at-large and, following incorporation of feedback, approved by the CCMG Board of Directors. The CCMG is a Canadian organisation responsible for certifying medical geneticists and clinical laboratory geneticists, and for establishing professional and ethical standards for clinical genetics services in Canada. Results and conclusions Recommendations include (1) clinical genome-wide sequencing is an appropriate approach in the diagnostic assessment of a patient for whom there is suspicion of a significant monogenic disease that is associated with a high degree of genetic heterogeneity, or where specific genetic tests have failed to provide a diagnosis; (2) until the benefits of reporting incidental findings are established, we do not endorse the intentional clinical analysis of disease-associated genes other than those linked to the primary indication; and (3) clinicians should provide genetic counselling and obtain informed consent prior to undertaking clinical genome-wide sequencing. Counselling should include discussion of the limitations of testing, likelihood and implications of diagnosis and incidental findings, and the potential need for further analysis to facilitate clinical interpretation, including studies performed in a research setting. These recommendations will be routinely re-evaluated as knowledge of diagnostic and clinical utility of clinical genome-wide sequencing improves. While the document was developed to direct practice in Canada, the applicability of the statement is broader and will be of interest to clinicians and health jurisdictions internationally. In recent years, the cost of DNA sequencing has declined rapidly.3 Next-generation sequencing (NGS) technologies have made it possible to interrogate a patient's genome in a cost-effective and efficient manner.4 While genome-wide sequencing in Canada has been performed on a research basis for several years, clinical diagnostic services based on these technologies are just now becoming available and are increasingly being requested. Ensuring that patients with genetic disease have appropriate access to these diagnostic tests has, therefore, become important. This document addresses the clinical use of genome-wide sequencing of germline DNA in the diagnosis of monogenic disease in Canada, but does not address the use of genome-wide sequencing in other medical contexts, such as molecular investigation of cancer or for population screening of healthy individuals. While the document was developed to direct practice in Canada, the applicability of the statement is not confined to Canadian borders and will be of interest to clinicians and health jurisdictions internationally. The Canadian College of Medical Geneticists (CCMG) is a Canadian professional organisation comprised of clinically trained medical and laboratory geneticists that establishes professional standards of clinical genetics practice across the country. This Position Statement provides recommendations on clinical genome-wide sequencing for those providing clinical genetic services in Canada. The statement was developed by two multidisciplinary working groups, one focusing on clinical indications and one on incidental findings. It was posted on the CCMG website on 14 January 2015 for comment by the membership and approved by the CCMG Board of Directors on 22 March 2015. Primary indication: The constellation of clinical features that lead to diagnostic evaluation by genome-wide sequencing. Medically actionable: A finding that may impact patient management to improve outcome. Genetic heterogeneity: The occurrence of similar or identical phenotypes as a result of disruption of different genes. Monogenic (Mendelian) condition: A genetic condition resulting from altered function of a single gene/locus. Multifactorial inheritance: Non-monogenic inheritance of specific traits that are determined by the combined action of multiple genetic and environmental factors. NGS: Massively parallel sequencing technologies that produce many hundreds of thousands or millions of reads simultaneously. Multigene panel sequencing: For the purpose of this document, multigene panel sequencing will refer to the targeted sequencing, primarily by NGS, of a selection of genes associated with a specific clinical presentation. Genes included in panels typically have a depth of coverage sufficient to minimise false negatives. Whole-genome sequencing (WGS): A process used to determine the sequence of most of the DNA content encompassing the entire genome of an individual. Whole-exome sequencing (WES): A process used to determine the DNA sequence of most of the protein-encoding exons found in the genome of an individual. Clinical genome-wide sequencing: A generic term for the process used to determine the sequence of most, if not all, clinically significant genes and its associated interpretation, including bioinformatic analysis and clinical genotype–phenotype correlation. This approach would be undertaken by an appropriately certified laboratory to address a clinical question. Primary finding: Genetic variant(s) identified by genome-wide sequencing that explain the primary indication for testing. Incidental finding: Genetic variant(s) identified by genome-wide sequencing unrelated to the primary indication for testing. Traditional genetic sequencing uses Sanger technology, which is limited by cost and throughput to the investigation of only one or a very small number of genes at any one time. The increased throughput of NGS permits DNA sequencing to be used in numerous ways within the clinic, to analyse, for example, one particular gene in multiple individuals (generally for population screening) or multiple genes at once in a panel format (eg, for a specific disease indication). NGS can also be employed to analyse several thousand genes with known clinical impact (eg, all genes listed in OMIM associated with human disease), the protein-coding portion of the entire genome (WES) or an individual's genome in its entirety (WGS). These last three approaches, referred to in this statement as clinical genome-wide sequencing, include the sequencing of genes that are not relevant to a patient's primary indication. The obvious advantage of genome-wide sequencing approaches is the potential to identify the genetic cause of a disease more efficiently. Data are now accumulating that highlight the diagnostic utility of genome-wide sequencing in the clinic. For example, a large clinical laboratory in the USA has reported a diagnostic rate of approximately 25% with WES in a cohort of >2000 patients with a range of phenotypes suggestive of monogenic disease.5 ,6 Other large cohorts have shown that this rate may increase to >30% with sequencing of both the proband and parents at the same time (trio analysis),7 and even further (to >40%) with careful selection of patients based on their clinical presentation.8 In many of these cases, a substantial amount of unrevealing genetic testing had been completed prior to WES. One could speculate that the success rate might be significantly higher if WES is initiated as a first-line investigation. Given the demonstrated diagnostic utility in this context, clinical genome-wide sequencing is being used increasingly in the diagnostic evaluation of patients with suspected genetic disease. Depending on the particular approach, clinical genome-wide sequencing has certain technical limitations, the details of which will not be addressed here but can be found elsewhere.9–11 These limitations can include incomplete coverage, which may result in false negatives, as well as the current inability to reliably assess certain disease mechanisms such as variation in repetitive elements (eg, trinucleotide repeat expansions) and structural variants, particularly with WES and other targeted clinical capture methods. With respect to reporting, there are ongoing challenges with the curation of databases of presumed pathogenic mutations.12 All of these limitations must be considered when this technology is used in the clinical setting. A review of the literature was performed to identify clinical indications for which genome-wide sequencing is beneficial. Literature on both WES and WGS, published before 1 December 2013, was examined. It is important to note that the majority of reported patients who had genome-wide sequencing (mostly WES) had their testing as part of a research study; as such, not all studies can be translated to the clinical setting. Publications in which single patients or small cohorts of patients were examined with the primary purpose of novel gene discovery were excluded. Publications were reviewed in detail by a minimum of two working group members (including medical geneticists, clinical laboratory geneticists and genetic counsellors) and discussed by the larger Clinical Indications Working Group (CA, FB, KB, KC, BF, MG, TH, SH, SM, JLM, BS, CvK). Each paper was assessed for its purpose, patient cohort, methods used, diagnostic rate and conclusions. The publications were grouped into the following categories for review: genetically heterogeneous diseases (eg, neuropathy, hearing loss, mitochondrial disorders), unexplained clinical (including prenatal) presentations suspected to be monogenic (eg, multiple congenital anomalies), common neurodevelopmental phenotypes (eg, autism, epilepsy, intellectual disability) and multifactorial diseases (eg, hypertension). Overall, the Clinical Indications Working Group defined broad factors that increase the likelihood of identifying a molecular cause for a patient's disease using genome-wide sequencing (table 1). It was recognised that a number of biases exist within the literature, such as inclusion of patients with highly specific phenotypes who had previously undergone uninformative genetic testing. In general, the factors listed in table 1 increase the chance that the cause of a disease phenotype is in fact monogenic and might be identified using genome-wide sequencing. These factors need to be considered when deciding which patients are most appropriate to undergo this type of clinical testing. In addition, several factors listed in table 1 facilitate the interpretation of genome-wide data in a clinical setting. 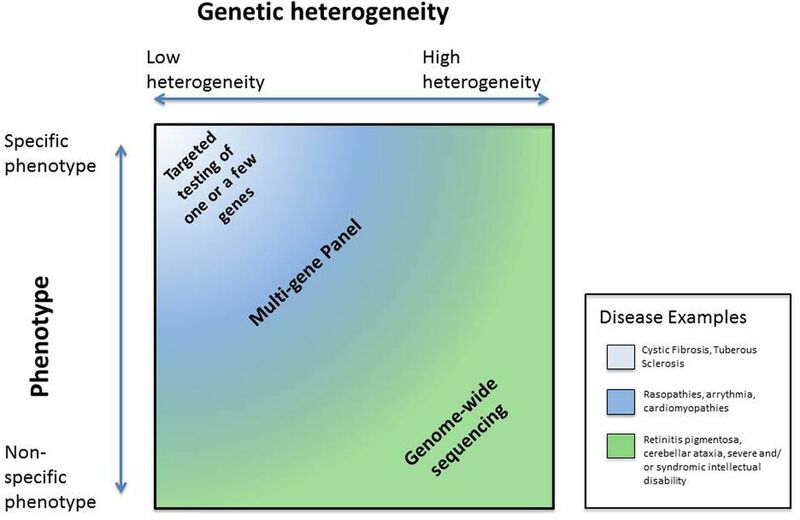 The disease presentations with the highest diagnostic yield through genome-wide sequencing were monogenic conditions associated with moderate to high genetic heterogeneity (ie, tens to hundreds of alternative genes). For example, cerebellar ataxia is a clinically and genetically heterogeneous condition that is a feature of >100 rare diseases with onset in childhood. A retrospective study of 28 families of children with cerebellar ataxia demonstrated a diagnostic success rate of 46% using WES,13 suggesting that WES or appropriately targeted clinical capture methods are an effective tool in the diagnostic evaluation of this particular set of patients. Similarly, there is literature to support the role of genome-wide sequencing in various unexplained clinical presentations.5 ,14 In the case of intellectual disability, there is evidence for the diagnostic utility of genome-wide sequencing in isolated cases when the patient is moderately–severely affected or has a syndromic presentation.15–17 In contrast, at this time there is little evidence for the diagnostic utility of genome-wide sequencing in patients with more complex neurodevelopmental phenotypes, such as non-syndromic autism.18 ,19 Nevertheless, clinical genome-wide sequencing should be considered in individuals with an autism spectrum disorder who have a comorbid intellectual disability and/or other syndromic features.20 There is currently no evidence to support the use of genome-wide sequencing to facilitate clinical care in patients with multifactorial diseases such as myocardial infarction.21 ,22 At the time of this review, there was a paucity of literature supporting the use of genome-wide sequencing in the prenatal setting. When determining the underlying cause of a suspected monogenic disease, there are a number of approaches that can be undertaken, depending on the phenotypic presentation and degree of genetic heterogeneity (figure 1). For example, in genetic conditions with a characteristic clinical presentation that is caused by disruption of one gene, or is associated with a small degree of genetic heterogeneity (eg, CHARGE syndrome or tuberous sclerosis), analysis of the individual gene(s) may be the first-line approach. For moderately specific phenotypes with moderate genetic heterogeneity, the choice of whether to use a multigene panel or clinical genome-wide sequencing may depend on the clinical scenario and resources available. For example, in patients being investigated because of a family history of inherited arrhythmias, identification of a genetic mutation has important implications for patient management, and in this scenario, a cardiac-focused multigene panel or a WES/WGS approach with comprehensive coverage may be the optimal choice of testing. A clinical genome-wide sequencing strategy accompanied by focused analysis of relevant genes may also be useful for conditions associated with a specific phenotype and high genetic heterogeneity (eg, retinitis pigmentosa) as it will allow the same approach to be used for patients with a variety of clinical presentations, thereby facilitating diagnostic access for a broad community of patients. For non-specific phenotypes (eg, moderate–severe intellectual disability) that are presumed to be monogenic and may have no clear optimal set of genetic investigations beyond chromosomal microarray, clinical genome-wide sequencing may also be indicated. For clinical presentations with low pre-test likelihood of a monogenic aetiology such as familial late adult-onset ischaemic heart disease, clinical genome-wide sequencing is not recommended. A schematic indicating the utility of different sequencing approaches based on phenotype specificity and genetic heterogeneity. Each of these technologies has strengths and weakness; genome-wide sequencing provides broader coverage in general but may have less coverage of specific regions, and thus has a risk of missing deleterious variants. Genome-wide sequencing may be considered for highly genetically heterogeneous conditions or in instances of undefined clinical syndromes suggestive of a genetic aetiology. The clinician must weigh the pros and cons of different approaches that are available. The issue of incidental findings as a challenge for diagnostic testing has been the subject of a long running debate in the clinical genetics community. Clinical genome-wide sequencing will generate data that are not related to the primary diagnostic question but may be useful in some clinical settings. The Incidental Findings Working Group (SA, KB, JF, TH, BK, A-ML, JL, JM, RM-L, TNN, JR, DLS, TS, ST, MZ) recognises that the clinical utility of the majority of incidental findings has yet to be established23 and the magnitude of potential risks has not been empirically determined. In 2013, both the European Society of Human Genetics (ESHG) and the American College of Medical Genetics and Genomics (ACMG) published recommendations on how incidental findings should be approached.24 ,25 The ESHG recommended that bioinformatic pipelines exclude genetic variants in genes unrelated to the primary indication in order to minimise discovery of incidental findings.24 They recommend that if an unsolicited genetic variant is detected despite the initial filtering of the data and is indicative of a serious health problem, either in the person tested or a close relative, health professionals should report such variants. In contrast, the ACMG took a more prescriptive approach. Their original recommendations called for the mandatory targeted analysis of a ‘minimum list’ of 56 genes for 24 inherited disorders deemed to be clinically actionable for any individual undergoing clinical genome-wide sequencing, regardless of age or primary indication.25 The ACMG subsequently modified their recommendations to permit patients to opt out of receiving incidental findings from clinical genome-wide sequencing.26 This modification moved the opt-out discussion to the point of patient consent and sample submission, rather than when results are received by the ordering clinician. The ACMG recommendations permit laboratories to report or not report other kinds of incidental findings, that is, those not included in the medically actionable list, at their own discretion. The publication of such statements and recommendations by these international organisations prompted reflection on the ethical issues around the reporting of incidental findings and resulted in the development of a proposed set of considerations for the Canadian context,27 which have been largely adopted here. Canada's publicly funded healthcare system, through the Canada Health Act, provides universal coverage for medically necessary healthcare services on the basis of need, rather than the ability to pay. The majority of services are provided by physicians and other professionals who are paid on a fee-for-service basis. This system is perhaps best described as an interlocking set of 10 provincial and 3 territorial health insurance plans, with the federal government providing partial funding to the provinces and territories. Decisions regarding resource allocation, including availability of particular services within each province and access to out-of-province genetic testing, are made by the individual provinces and territories and differ across the country. Thus, each province and territory needs to consider how new testing technologies should be implemented. In addition, physicians practising within each province need to balance their obligations to the individual patient with the use of finite resources within the province when considering diagnostic options. These recommendations provide an opportunity for consistency in the approach to the use of clinical genome-wide sequencing across the country despite provincial jurisdiction. 1.1 Given the complexity of interpretation and counselling, clinical genome-wide sequencing should only be ordered by a clinical geneticist or other physician with sufficient expertise in use of the technology and clinical interpretation of the results. 1.2 Clinical exome sequencing, at this time, should only be used to interrogate the genome for nucleotide sequence variants in genes known to cause disease. Clinical WGS may be used to detect CNV and structural variation in addition to sequence variants, though it is not currently a first-tier test for such analyses. genome-wide sequencing is a more cost-effective approach than available individual gene or gene panel testing. 1.4 Testing should always be done on the affected individual and discussion held with the clinical laboratory to determine whether additional affected relatives or unaffected parents should be analysed concurrently, if available. 1.5 Careful consideration of the issues and complexities around clinical genome-wide sequencing should be undertaken before its use prenatally, as limited evidence currently exists supporting its use. 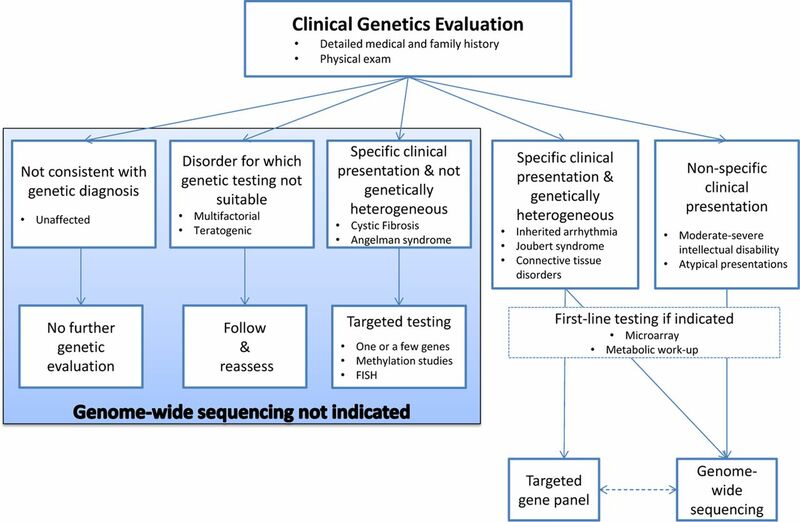 The Clinical Indications Working Group has developed a decision aid for the incorporation of genome-wide sequencing into the diagnostic evaluation of patients with rare diseases (figure 2). The most critical component of this process is clinical phenotyping. This suggested framework is based on our current understanding and will be re-evaluated over time as new data become available. Ultimately, the ordering physician's clinical judgement should prevail. 2.1 Standard clinical assessment, including detailed phenotyping, should be undertaken prior to testing to facilitate interpretation of the genome-wide variants. an explanation of what will happen with data, including how long they will be stored, and if and when additional analysis or re-analysis will be performed in the future. 2.3 All patients/families should be given the option of having coded or anonymised genome-wide and phenotypic data deposited and stored in an international database to assist in interpretation of genome-wide studies of themselves and other patients. 2.4 All patients/families should be given the opportunity to enrol in current or future research studies to understand the relationship of genome-wide variants found in them and clinical abnormalities. Decision aid to facilitate the diagnostic evaluation of patients with rare disease of suspected monogenic aetiology. This decision aid highlights where genome-wide sequencing may prove useful in the evaluation process. The conditions listed in each box are representative examples only. For specific clinical presentations associated with genetic heterogeneity, the decision regarding the use of a targeted panel versus genome-wide sequencing is dependent on a number of factors, including the availability of the testing options and the yield of such panels. Patients with negative targeted gene panels may benefit from subsequent clinical genome-wide sequencing. Conversely, consideration of a targeted panel subsequent to uninformative clinical genome-wide sequencing would be dependent on the depth of coverage achieved in the latter instance. 3.1 Competent adults should be given the option prior to testing to receive (or not receive) incidental findings unrelated to the primary test indication. Adult patients should be fully informed about what type of incidental findings could occur with the specific test being considered, which incidental findings will not be returned to them (eg, incidental variants of uncertain significance or low-penetrance genetic predispositions) and which incidental findings the patient may have returned if s/he so chooses. 3.2 In children, incidental results that reveal risk for a highly penetrant condition that is medically actionable during childhood should be reported to the parents. A child's risk for adult-onset genetic conditions should not be communicated unless (1) the parents request such disclosure, AND (2) disclosure of the information could prevent serious harm to the health of a parent or family member, as determined on a case-by-case basis. There is no obligation to re-contact paediatric patients as adults to let them know of potentially later-onset monogenic diseases. 3.3 For incompetent adults, results revealing a highly penetrant medically actionable condition should be reported to the legal representative, unless the incompetent adult concerned expressed wishes to the contrary while still competent. 4.1 Clinical genome-wide sequencing should be performed in an appropriately accredited clinical laboratory. 4.2 Laboratory reports should include specific information describing the clinical genome-wide sequencing methodology used and approach to analysis. Supplemental information should include lists of genes examined if the analysis is limited to a subset of genes. 4.3 The laboratory report for clinical genome-wide sequencing should include an interpretation by a clinically trained and certified PhD or MD molecular geneticist; in Canada, this would typically be one with CCMG certification. 4.4 Interpretation of results should include assessment of current peer-reviewed literature and databases of known variation, and take into account the known limitations of these resources. 4.5 In instances where parental samples are analysed to help interpret a child's data, laboratories should establish, and make available, policy on whether parental reports will be issued and what kind of information they will include. 5.1 The ordering clinician should review the report and place the findings into context with other relevant medical considerations when discussing the results with the patient/family. 5.2 The patient (and family when appropriate) should receive standard-of-care genetic counselling and management regarding any new diagnosis. 5.3 In the case in which the laboratory identifies multiple candidate variants, additional literature review, database searching and phenotyping should be considered by the ordering clinician. Further analysis might lead to a diagnosis at a later date when more knowledge is available. Requests for re-analysis of the sequencing data should be initiated by a referring physician based on an established policy. This may involve re-testing rather than re-analysis, at the discretion of the laboratory. Further analysis of the sequencing data through research may be an option. A clear distinction should be made between clinical and research analysis, and explicit informed consent obtained for the latter (see points 2.3 and 2.4). Genome-wide sequencing is a useful diagnostic test in a number of clinical scenarios for patients with known or suspected genetic disease. These recommendations were developed on the basis of evidence to facilitate clinical translation of this technology and contribute to best practices in Canada. The indications and approaches we outline here will evolve over time as more data are generated. All Canadian jurisdictions need to discuss and plan for the implementation of clinical genome-wide sequencing in the near term. These recommendations may also prove useful to other countries in the process of translating these technologies to the care of patients with monogenic diseases. Prevalence of rare diseases: Bibliographic data. Orphanet Reports Series 2014;Rare Diseases collection(1). American College of Medical Genetics and Genomics. ACMG Updates Recommendation on “Opt Out” for Genome Sequencing Return of Results. 2014. Contributors KB, TH and CA were responsible for identifying the literature, summarising working group meetings and drafting the manuscript. All authors contributed to the conception and design of the position statement, interpretation of data, critical revisions contributing to the intellectual content and approval of the final version of the manuscript. Funding This work was supported by the Care4Rare Canada Consortium funded by Genome Canada, the Canadian Institutes of Health Research, the Ontario Genomics Institute, Ontario Research Fund, Genome Quebec, Children's Hospital of Eastern Ontario Foundation, Alberta Children's Hospital Research Institute, Alberta Innovates Health Solutions, and Hospital for Sick Children.